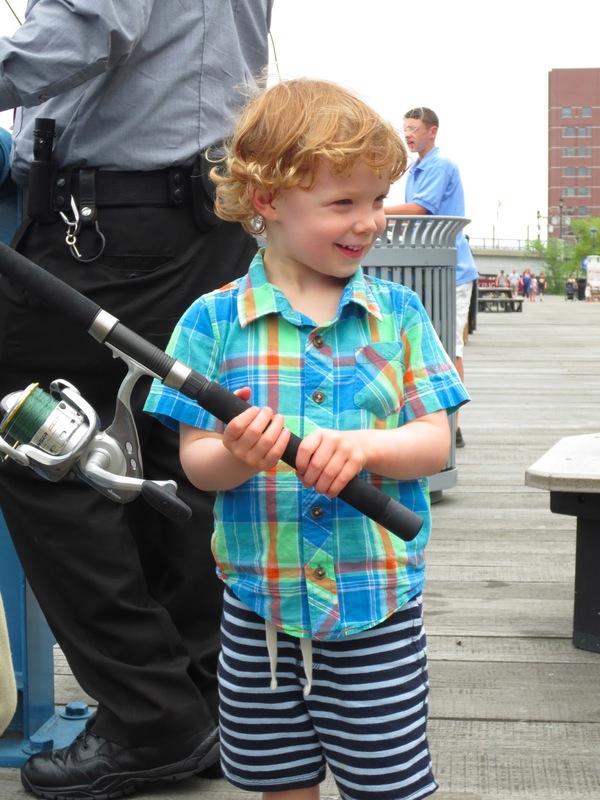 What better way to celebrate your birthday than fishing off the pier at the Boston Children’s Museum! Yesterday, Mark and I both celebrated turning a year older (and hopefully wiser!) while showing kids the art of crabbing and fishing at the Boston Children’s Museum. Team Children’s Museum has been a crab-catching-machine the past three days. We have caught 61 crabs along with two fish, a baby Flounder and Striped Bass and cannot wait to get back on the pier tomorrow! The families visiting the Children's Museum have loved the touch tank filled with crabs and the ability to fish - some for the very first time! The Junior Program Assistants (JPA) have been doing a great job educating the kids on how to identify male and female crabs, the different types of crabs caught, and how to hold a crab without getting pinched. As one of the kids said yesterday, "I don't want that crabby pinching off my fingers!" Not only are the JPA's well educated in identifying different types of sea creatures, they also know what bait attracts the most crabs. Veteran Junior Program Assistant, Ahmed, was quick to think of a solution for our absence of crabs this morning: hot dogs. We purchased hot dogs from a local store and it was an instant success. We were soon catching more crabs than ever and the kids couldn't believe the crabs liked hot dogs as much as they do! I mean, who doesn't love hot dogs?! Between birthdays and hot dogs things are heating up at the Boston Children's Museum. Stay tuned to see what we catch next!